We are seeking public funding for two new research projects to further the cause of birds of prey. This follows on from the success of the live peregrine falcon camera and falcon blog we have run at the University over the past few years. We are also seeking donations for our partners in this project, the Nottinghamshire Wildlife Trust. The decline of birds of prey such as the peregrine falcon in the late 1950s, due to the use of pesticides and human persecution, has been well documented. Although populations have now largely recovered, peregrines are only present in the UK in low densities of approximately 1,500 breeding pairs which represent around 20% of the European peregrine population. Biosciences lecturer David Hughes is working on collating a DNA database aimed at protecting endangered birds of prey. He is doing this in association with the Nottinghamshire Wildlife Trust (NWT) and Nottinghamshire Police to develop a database of genetic fingerprints for peregrine falcons and goshawks. Once formed, the database will be used to cross reference DNA samples collected by NWT officers and the police during investigations into suspected theft of chicks and eggs. These DNA profiles will not only help in identifying individual birds, but could also help in identifying their parents. In instances where eggs, chicks or droppings - which provide evidence of a bird having been present in an aviary – are found in suspicious circumstances, the DNA collected could point investigators to parent birds that are on the database. This evidence would help in dismissing any claims from suspects that the birds had been bred and reared in captivity. Environmental Sciences lecturer Louise Gentle is investigating peregrine falcon nesting success. This will be measured by the number of chicks to fledge the nest, in relation to both behavioural and environmental factors. This research will determine which factors are most important in determining nesting success. Peregrine falcons will be monitored via the use of web cameras broadcasting from a number of nests across the UK including the one on NTU's Newton building. These findings will be useful for aiding the study of behavioural and evolutionary ecology in animals and it is hoped that they will also contribute towards the continued conservation of the peregrine falcon. Nottinghamshire Wildlife Trust (NWT) is the county's largest locally based conservation charity and has been working closely with Nottingham Trent University to protect the peregrine falcon nest on the Newton Building for many years. NWT works to protect all species and habitats across the county and advises a number of landowners about the protection of species such as the peregrine. Making a Personal Donation - You can make a personal donation to support Birds of prey conservation projects by setting up a direct debit or making a single donation. Make a donation online now, or download a donation form to return by post. If you have any questions about making a personal donation (including the tax implications) then please email Stephen Knott, Alumni and Community Giving Officer. 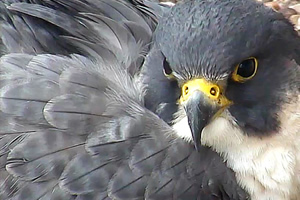 Telling your Friends - If you have enjoyed viewing the falcon camera and reading the falcon blog, please forward details to your friends so that they also have the opportunity to observe and support this important work. If you have any further questions about these projects or the work of the Development and Alumni Relations Office please contact Stephen Knott, Alumni and Community Giving Officer via email or call +44 (0)115 848 8807.